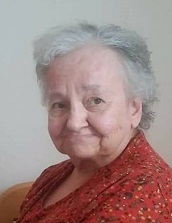 Patricia A. Gurnee, 75, formerly of Oil City died at 2:10 P.M. Saturday August 11, 2018 at Shippenville Healthcare and Rehab after an extended illness. Born Dec. 10, 1942 in Akron, OH, she was the daughter of the late Charles & Mildred Constantine McGinnis. Patricia was a graduate of Oil City High School. She was employed many years at the Villa Italia Restaurant and did private duty work for the Visiting Nurses Association. A member of St. Stephen's Church, Pat enjoyed crocheting and selling Avon. Amanda Morrison and husband Terry, Jacob Glass and wife Julia, and Brittany Smith and husband Eric. Comittal Services will be held at 3:45 P.M. on Tuesday in the chapel at Calvary Cemetery with Fr. John Miller, Pastor of St. Stephens Church , Presiding. Memorials may be made to Alzheimer’s Research.